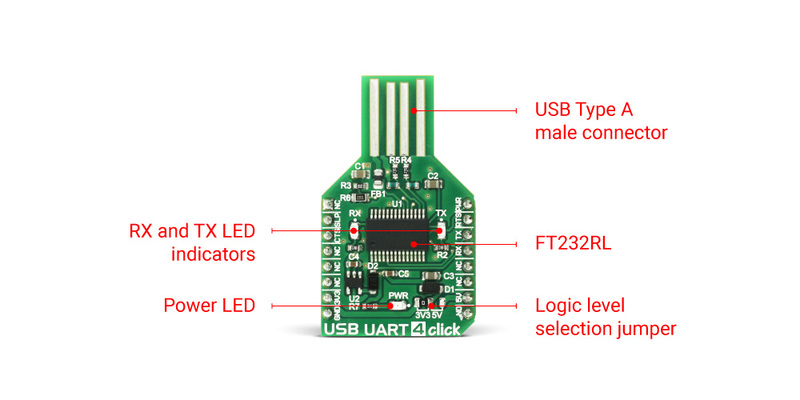 USB UART 4 click features well-known FT232RL USB-to-UART interface module from FDTI. It provides USB to asynchronous serial data transfer interface, allowing the microcontroller based designs to communicate with the personal computer, in a very simple way. FT232RL is a very popular USB to UART interface IC, used on many MikroElektronika devices, both for its reliability and simplicity. USB UART 4 click is used for whenever there is a need to seamlessly and effortlessly interface the UART lines to a personal computer. It can be used with the UART terminal, found in MikroElektronika compilers. The entire USB protocol is handled on the module, thus no USB specific firmware programming is required. FTDI provides royalty-free Virtual Com Port (VCP) and Direct (D2XX) drivers for all the major OSes, used on personal computers. FT232RL contains integrated 1024 Bit internal EEPROM for storing USB VID, PID, serial number, product description strings and CBUS I/O configuration. The Baud Rate Generator provides a 16x clock input to the UART Controller from the 48MHz reference clock. It consists of a 14 bit pre-scaler and 3 register bits which provide fine tuning of the baudrate - used to divide by a number plus a fraction. This determines the baud rate of the UART, which is programmable from 183 baud to 3 Mbaud. Also non-standard baud rates are supported. The baud rate is automatically calculated by the FTDI driver, so it is enough to simply forward the desired baudrate to the driver, usually done by selecting the baudrate via the OS terminal application. After installing the OS drivers, device is ready to be used. When plugged in, it will create a virtual COM port. Then, it can be used with the USART Terminal application, included in every mikroE compiler, for the data exchange between the MCU and the host computer, via the UART pins of the click board. More information about working with the UART communication in general can be found in the following Learn article. This device also features the configurable CBUS pins, which can be used for several different useful functions, as for example - configurable clock out for driving the microcontroller, data LED drive, USB Sleep, PWR status and so on. By default, CBUS3 and CBUS4 pins are configured as Power Enable and Sleep options and are routed to the PWR and SLP pins of the mikroBUS™. More information about configuring the CBUS pins can be found in the FT232RL datasheet. SLP output pin will be set to a LOW logic state during the USB suspend mode It can be used to power down external circuitry or be used for similar purposes. PWR output pin will be set to a LOW logic state, after the device has been configured by the USB, then HIGH during the USB suspend mode. This can also be used for the powering down / power saving, by turning unneded external circuitry. This device also supports two additional signals - RTS (Request To Send) and CTS (Clear To Send), which can used in case when the hardware flow control is used. One feature worth mentioning is this click board™ specific shape - it is made so that can be plugged in directly into the USB Type A port. It doesn’t have a conventional USB connector, but the PCB is shaped so that the USB traces can be easily connected to the USB port. Since the FT232RL supports the unique serial number feature, this makes it handy for developing data protection devices and dongles of various kinds. Of course, it can also be used in a traditional way. USB UART4 click also features a small low noise LDO, used to regulate the input voltage, as well as shotky and transient voltage suppression diodes, to additionally improve the circuit stability and immunity to signal interferences. Applications Useful whenever a simple and ready-made solution for interfacing USB to UART is needed, for a wide range of applications. Key Features Integrated support for the USB protocol, no need to develop dedicated firmware for handling the USB to UART communication, CBUS programmable pins, unique serial number programmed in OTP memory.